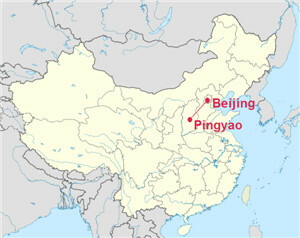 Pingyao is about 580km from Beijing, the capital of China. This page will focus on how to travel from Beijing to Pingyao. Step 1: Book a plane ticket or train ticket from Beijing to Pingyao. There are 8 flights flying from Beijing to Taiyuan. It takes about 1h10min to fly from Beijing Capital International Airport to Taiyuan Wusu Airport. Ticket price from CNY330. You can take No.201,901 Bus to the downtown. It takes about 1.5-2h to Pingyao from Taiyuan. Ticket from CNY6.5 . There are two railway stations in Taiyuan, which are Taiyuan Railway Station and Taiyuan East Railway Station. Because there are no high-speed trains from Beijing to Pingyao, however there are high-speed trains from Beijing to Taiyuan and Taiyuan is near Pingyao. So,you can take the high speed trains from Beijing to Taiyuan(2h30min-3h).Then take trains from Taiyuan to Pingyao(1h30min-2h). In this way, it is more comfortable and time-saving (4h-5h)and the cost is just a little higher than the direct trains. There are 8 high speed trains from Taiyuan to Beijing. The trains depart at Beijing West Railway Station and arrives at Taiyuan Railway Station. Step 2: Book a hotel in Pingyao. Since Pingyao is an ancient town, you probably want to experience a more ancient way of accommodation. There are hotels furnished with Chinese tranditional style furniture and decorated with Chinese ornaments. Just like an ancient inn, being there will take you back to the old times. Step 3: Take a tour in Pingyao. Getting around in Pingyao will not take you too much time, just 1 or 2 days is quite enough. If you have a few days to spare, it is suggested that you pay a visit to other attractions in Shanxi Province, such as Yungang Grottoes and Hanging Monastery in Datong, Wutai Moutain in Xinzhou, Hukou Waterfall in Linfen, etc.